Spiritual Spectra offers services to heal mind, body and spirit. Choose the service(s) which best suits your needs at this time. Click on the title link for more information about each service. Energy Healing is a gentle, yet powerful healing therapy that releases stress, anxiety, negativity & emotional baggage. Energy Healing can produce feelings of peace, serenity and well-being. Energy Healing is simple, natural and safe and all who experience it benefit from it. Establishing a Corporate Wellness Program can help your employees become emotionally healthy and well-balanced which will make them more productive, efficient and creative at work. We can provide Meditation and/or Energy Healing Sessions that can help your executives and staff improve their overall health and well-being. Our services can be provided on-site at your business office, at a corporate retreat or at our office in Maryland. Millions of people are coping better with the hectic stresses of life by finding a new peace through the practice of mindfulness meditation. Our Meditation Circle offers a quiet, peaceful environment to help you let go of the mental chatter so you can go inward and connect spiritually. 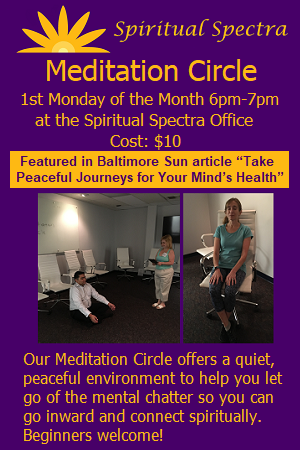 The Meditation Circle will often feature Guided Meditations. Beginners welcome! Spiritual Spectra offers a variety of talks and workshops on life guidance, spiritual and healing subjects. Check our Events page for upcoming talks and our Calendar of Events for all of our upcoming events.